If you are moving across the country for a new job or spending your winter on Florida’s coast, you may think that driving is your only option. However, there is a faster, easier, and safer alternative. You can choose to ship your car with a reputable auto transport company. This allows you to fly to your destination, saving you valuable time and sparing your vehicle excessive mileage. When it comes to choosing an auto transport company, National Dispatch is the best option. Our top priority is our customers, which means that we seek to provide a range of auto shipping services that will meet each individual’s unique needs. No matter where, in the United States, you need your car shipped, we can handle the transport of your vehicle. Miami tends to be a popular destination for those looking for a new home or vacation spot. The better question is why wouldn’t you want to move to Miami. Miami is located on the southeastern tip of Florida. Seeing that Cuba is not very far away, the island has had some influence over the cuisine in Miami. Due to Miami’s location near the Atlantic Ocean, you will find plenty of opportunities to soak up the sun on one of the many beaches lining Florida’s coast. If you live in Miami, there is no need to complain about the weather. With temperatures ranging from the 70s to the low 90s, it is the perfect place to visit, even in the winter. Shorts and flip flops are a must when living here. You do need to be aware of the possibility for hurricanes from June to November. Learn how to prepare your car for a hurricane. Miami can make a great place to raise a family. Put in the time and research to find a neighborhood and school system that suits your needs. There are hundreds of public and private schools to choose from. In addition, your child can choose to continue their education, in state, at the University of Miami. Orlando is only a 3-hour drive, so it is well worth making a trip to check out the parks at Disney World and Universal Studios. Learn about about using auto shipping when moving houses by reading our Moving Tips: Shipping Your Car For A Stress-Free Move. Why do people choose to retire in Florida? Florida has no state income tax, no inheritance tax, and no estate tax. In addition to its lack of taxes, its climate is what really draws folks in. Although it can get hot in the summer time, for those who hate the cold, Florida makes the perfect spot to settle down. There is also a lower cost of living in the state, compared to the national average. This means that you have more money to do other things that you enjoy, such as travel or spend time with friends and family. Learn more by reading our Moving After Retirement: Why, When, Where, How? Snowbirds are seasonal travelers who travel from their northern home in the winter to temporarily take residence in a warmer climate. Florida is just one of the many destination spots, in the nation, that snowbirds choose to travel to. For snowbirds looking to enjoy their winter outdoors in the sunshine, Miami presents many opportunities to do so. Locals and visitors enjoy golfing, fishing, boating, biking, and water sports. Being stuck in your house all winter can be difficult, but you can go to Miami and enjoy a walk on the beach, instead. Learn more about snowbird car shipping by reading our Snowbirds: Car Shipping And Helpful Tips For The Season. When it comes to deciding on which car shipping services would best suit your needs, you have a wide range of options to choose from. Below, you find a list of some of our car shipping services. This is the standard method for shipping a vehicle. It also happens to be the most cost-effective method. If you choose to ship your car by open auto transport, your vehicle will be loaded onto an open-air carrier. These are the types of carriers you have likely seen driving down the road, hauling cars to dealerships and other locations. As you have seen, the cars are exposed to the elements of the road and weather conditions. If you want a little protection for your car, then enclosed auto transport is the way to go. With this method of transport, your car will be transported via an enclosed carrier with side walls and a roof. This shields your car from all road elements and weather, including ice, snow, rain, and hail. Due to the level of protection it provides, this shipping option is more expensive in comparison to open auto transport. The point of using an auto shipper is to make your life easier. With door-to-door auto shipping, the driver will come directly to your home or place of business for pickup and delivery. This makes shipping fast, convenient, and easy for you, the customer. At National Dispatch, we offer 3 different shipping options, one of which is recommended for those pressed for time. If you need your car shipped ASAP, use our guaranteed shipping option for a shorter time window. You will receive your car sooner, rather than later. 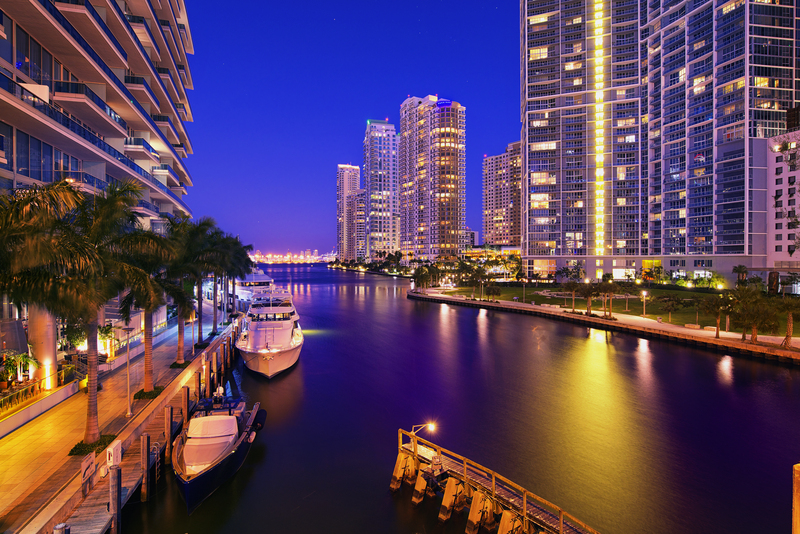 Learn more about moving to Miami by reading our Auto Shipping Services: Florida. There’s nothing left to do now but get a quote. A car shipping quote provides you with a general estimate of how much auto transport will cost you. For a free, instant car shipping quote, use our online quote calculator. Only 4 simple fields are required: vehicle make, vehicle model, pickup location, and delivery location. No personal information is needed. If you would like to speak with an auto transport representative, call us at 800-321-2051. We look forward to your call!